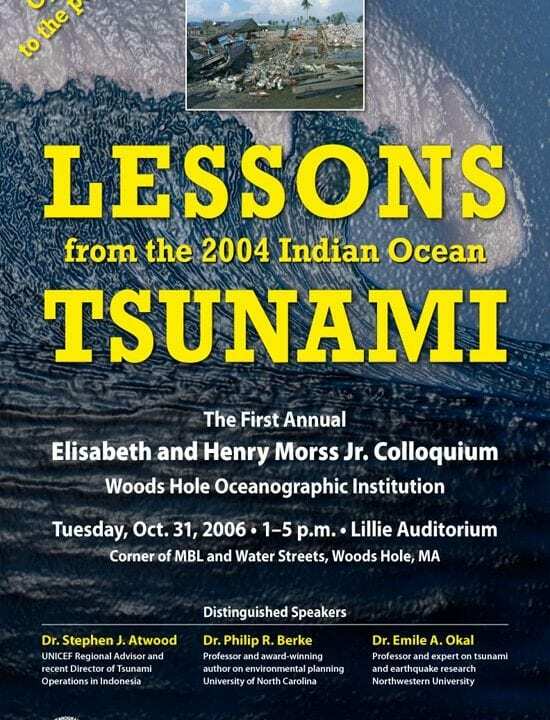 Woods Hole Oceanographic Institution will convene two special conferences this fall to learn from the devastating 2004 tsunami that left more than 220,000 people dead or missing. In July, another tsunami in the same region killed several hundred people and displaced more than 50,000 others. Dr. Philip R. Berke, award-winning author on environmental planning; consultant for local and state governments, and international organizations; and director of graduate studies in city and regional planning at the University of North Carolina. Dr. Emile A. Okal, professor of geology at Northwestern University, who has extensive field experience in post-tsunami investigation and survey, including, most recently, as leader of two teams that assessed the effects of the 2004 Indian Ocean tsunami in Madagascar and Oman. Okal also collaborated in the development of TREMORS, an automated distant earthquake-detection system, nownow deployed in Hawaii, Indonesia, and Chile, that helps estimate tsunami risk. The event is sponsored by a generous gift by Elisabeth W. and Henry A. Morss Jr., which established a fund at WHOI to support public colloquia on issues of global importance that are connected to human society and involve some aspect of science. 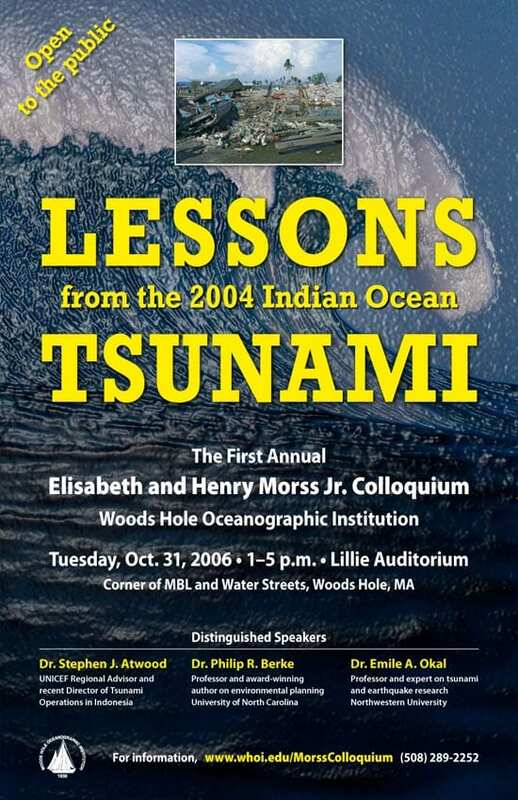 It will take place 1 to 5 p.m., Oct. 31, 2006, in the Lillie Auditorium at Marine Biological Laboratory in Woods Hole. The second conference, on Oct. 30 and 31, brings together international geophysicists, geologists, physical oceanographers, engineers, and graduate students to accelerate research to improve understanding of fundamental tsunami mechanisms in an effort to more accurately forecast tsunamis and mitigate their impacts on coastal regions. 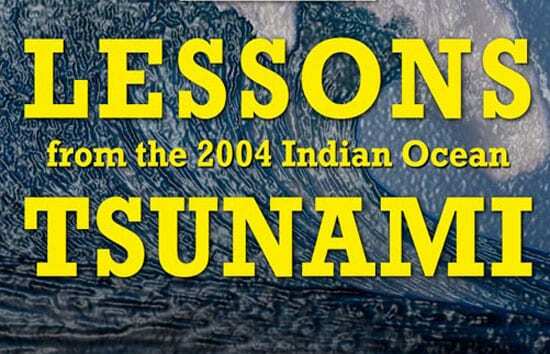 The researchers will share knowledge on how tsunamis are triggered by underwater earthquakes, submarine landslides, volcanic eruptions, and other geological processes, and how tsunamis run up and dissipate in coastal areas. The conference is sponsored by the Deep Ocean Exploration Institute and the Coastal Ocean Institute at WHOI. It will be held in Clark Laboratory at WHOI.